The frigid seas of the Canadian Arctic and Canada’s north Atlantic waters are dotted with icebergs—vast freshwater mountains whose small floating peaks belie huge submerged proportions that dwarf even the largest sea animals. 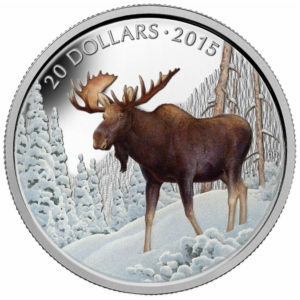 SKU: 127161 Categories: 2013, Under $25, 1/4oz, Nature & Wildlife, Series, RCM Silver Tags: 1/4oz, 20 for 20, 2013, 27mm, Animals, Canadian Coin, Emily S. Damstra, Released Jul-13, Royal Canadian Mint, Silver Coin. Designed by Canadian artist Emily Damstra and engraved in fine detail, the reverse image presents a humpback whale cow and her calf swimming alongside an iceberg. In the foreground and to the right side of the image, the large female is viewed from the front and left, her long pectoral fins extending behind her and the knobbed skin around her large mouth rendered in dimensional detail. Behind her, swimming close to its mother’s powerful tail, is a smaller humpback calf, presented from its left side. Its body bows gracefully toward that of its mother. The massive migratory ocean mammals swim alongside an iceberg which dominates the left side of the image. Its sharp pyramidal summit floats above a stylized waterline, while most of its bulk floats below the surface. 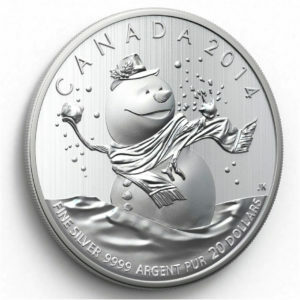 – The “Iceberg” is the ninth coin in the Royal Canadian Mint’s highly successful, fine silver (99.99% pure) 20-Dollar coins. 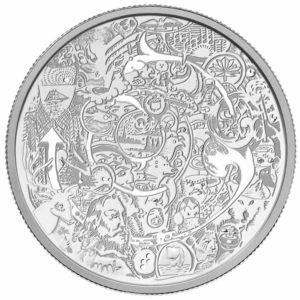 – Unbeatable price – the most affordable fine silver (99.99% pure) coin currently offered by the RCM. Each coin is encapsulated, inserted in a clear vinyl pouch which will be presented in a certificate booklet. Because the density of pure ice is about 920 kg/m³, and that of sea water about 1025 kg/m³, typically only one-ninth of the volume of an iceberg is above water. The shape of the underwater portion can be difficult to judge by looking at the portion above the surface. This has led to the expression “tip of the iceberg”, for a problem or difficulty that is only a small manifestation of a larger problem. Icebergs generally range from 1 to 75 metres (3.3 to 246 ft) above sea level and weigh 100,000 to 200,000 metric tons (110,000 to 220,000 short tons). The largest known iceberg in the North Atlantic was 168 metres (551 ft) above sea level, reported by the USCG icebreaker East Wind in 1958, making it the height of a 55-story building. These icebergs originate from the glaciers of western Greenland and may have an interior temperature of -15 to -20 °C (5 to -4 °F). Though usually confined by winds and currents to move close to the coast, the largest icebergs recorded have been calved, or broken off, from the Ross Ice Shelf of Antarctica. Iceberg B-15, photographed by satellite in 2000, measured 295 by 37 kilometres (183 by 23 mi), with a surface area of 11,000 square kilometres (4,200 sq mi). The largest iceberg on record was an Antarctic tabular iceberg of over 31,000 square kilometres (12,000 sq mi) [335 by 97 kilometres (208 by 60 mi)] sighted 150 miles (240 km) west of Scott Island, in the South Pacific Ocean, by the USS Glacier on November 12, 1956. This iceberg was larger than Belgium. In addition to size classification, icebergs can be classified on the basis of their shape. The two basic types of iceberg forms are tabular and non-tabular. Tabular icebergs have steep sides and a flat top, much like a plateau, with a length-to-height ratio of more than 5:1. This type of iceberg, also known as ice islands, can be quite large, as in the case of Pobeda Ice Island. Antarctic icebergs formed by breaking off from an ice shelf, such as the Ross Ice Shelf or Filchner-Ronne Ice Shelf, are typically tabular. The largest icebergs in the world are formed this way.